With the 2019 launch of the all-new exclusive Triumph Factory Custom line, Triumph delivers a landmark moment for British custom design. Every TFC model will be built to embody the pinnacle of custom Triumph design with enhanced levels performance, technology, engineering, specification and finish. 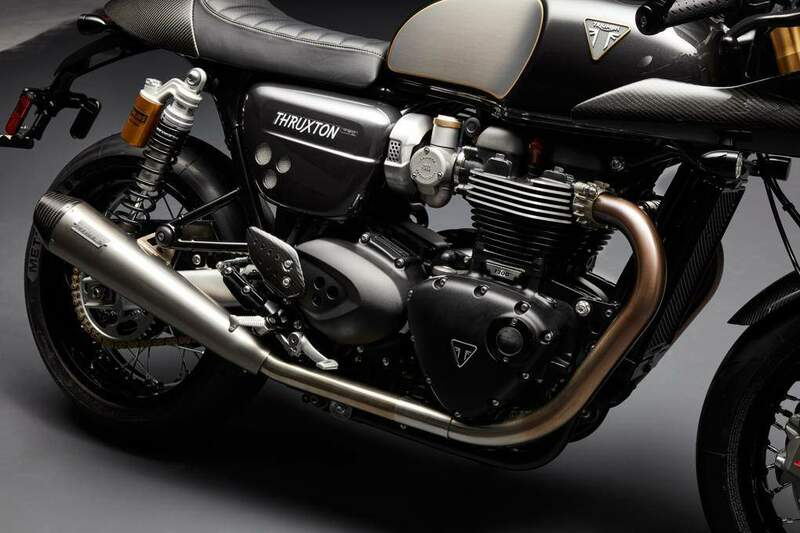 With only 750 to be sold worldwide, the Thruxton TFC will be Triumph’s most exclusive and desirable Modern Classic. Featuring premium TFC badging, instrument faces augmented with gold detailing and a beautiful, individually-numbered plaque on the top yoke, each one will be unique and never to be repeated. Every Thruxton TFC owner will also receive a special, tailor-made TFC handover pack unique to their bike featuring a numbered letter signed by Triumph’s CEO Nick Bloor, a custom-build book and a beautiful Thruxton TFC bike cover. 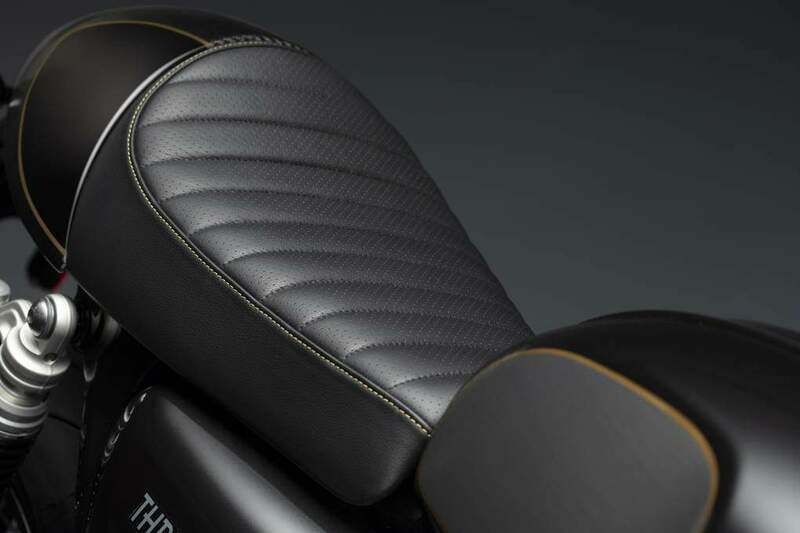 Visually striking, the new Thruxton TFC features beautifully engineered, lightweight carbon fiber bodywork including a stunning one-piece carbon cockpit fairing, front mudguard, seat cowl, heel guards and silencer end caps. Additional detailing includes a billet machined aluminum top yoke with TFC branding, premium brushed nickel mirror centers, a tinted screen, a leather seat with stitched detailing, and a billet machined aluminum oil-filler cap. These exquisite details come on top of a host of beautiful blacked out features, including premium black anodized multi-spoked wheels, black Öhlins RSU springs with black decals, black engine covers and a black tail tidy. 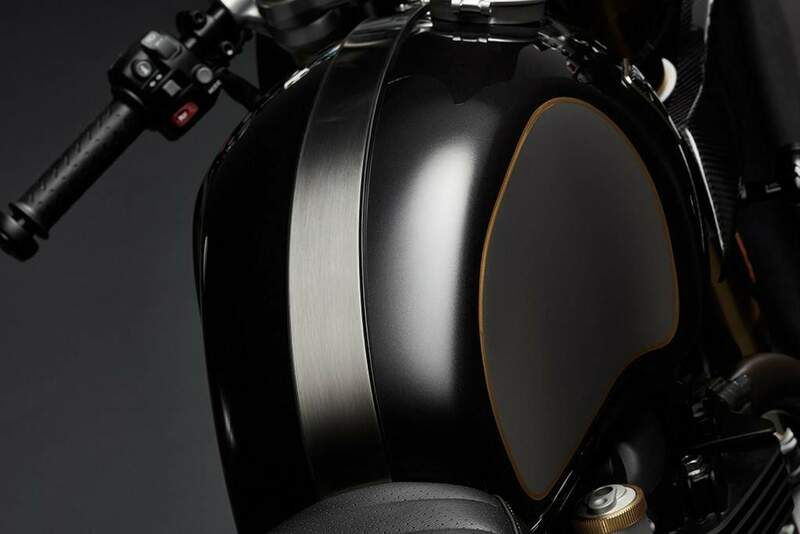 To perfectly complement the black theme and real carbon fiber, the Thruxton TFC is available in one signature paint scheme – a distinctive Carbon Black with brushed tank knee pad detailing and hand painted gold lining. 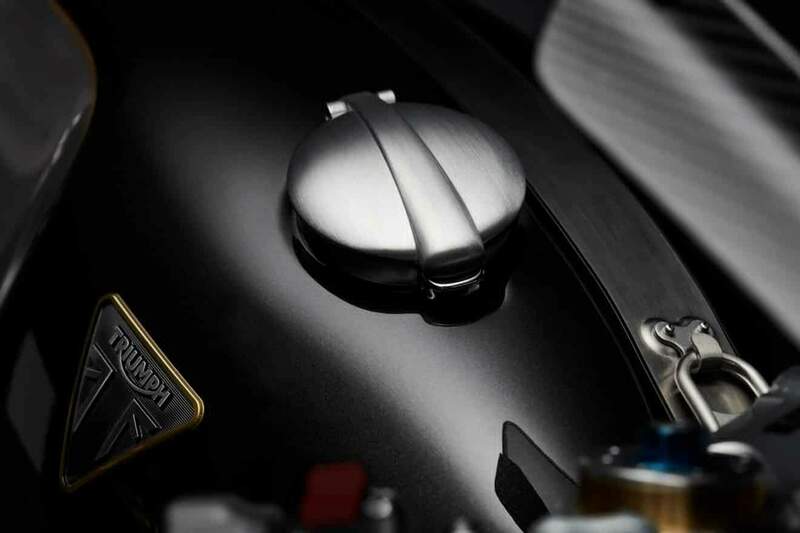 The premium gold detailing is applied across the entire motorcycle, from the lining on the fairing to the detailing in the badging and instrument faces, right down to the ignition key, and even features a stylish custom gold drive chain. 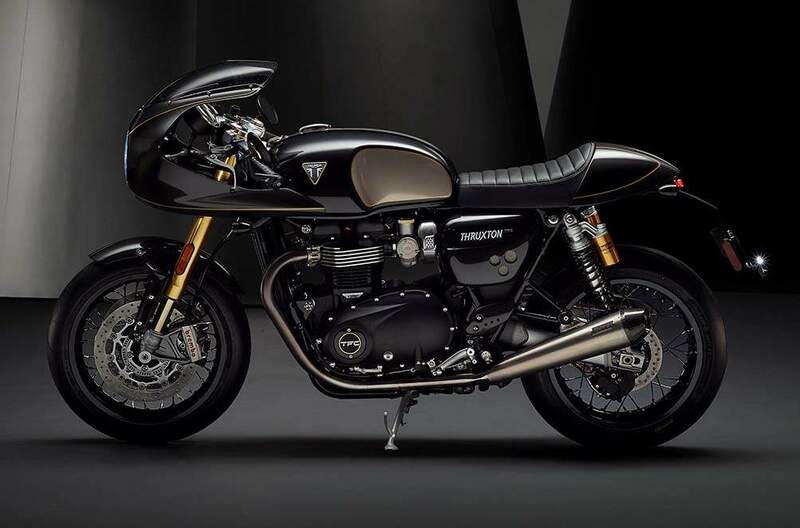 The Thruxton TFC also retains all of the distinctive core Thruxton features, such as the brushed flip-top Monza fuel cap, twin throttle bodies with brushed intake finisher, Daytona R foot pegs and clear anodized aluminum swing arm. The new Thruxton TFC achieves an incredible 10 horsepower more than the standard Thruxton R. This is delivered by significant engine upgrades including lightweight engine components, high compression pistons, and revised ports and cam profile. Along with the higher power, the Thruxton TFC also delivers a punch of torque both low down and across the entire rev range, peaking at 85 Ft-lbs. 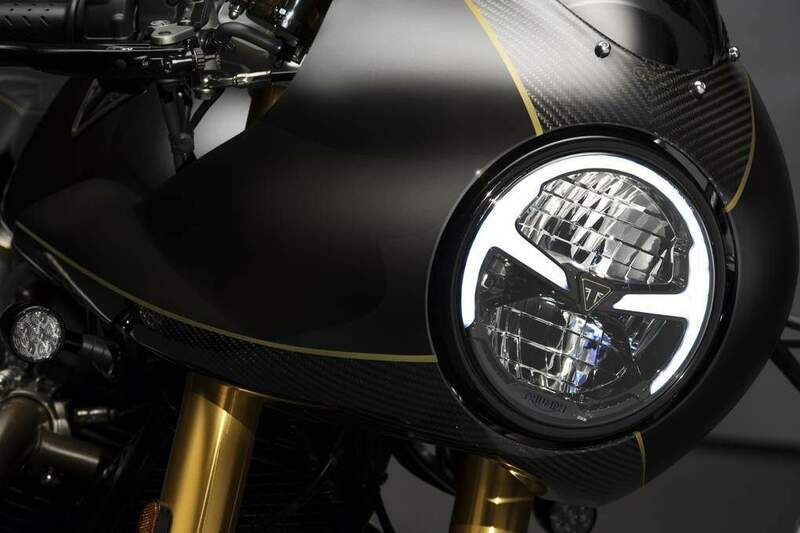 There is also a premium, one-of-a-kind exhaust system manufactured exclusively for the Thruxton TFC by Vance & Hines, featuring titanium silencers, carbon fiber end caps, and finished with a unique laser-etched co-branded logo. For an even more dynamic and agile ride, significant weight savings across the entire motorcycle make the Thruxton TFC 11 pounds lighter than the standard Thruxton – delivered by way of refined engine components, carbon fiber bodywork, aluminum engine cradle rails, rear mudguard removal and a lightweight battery. 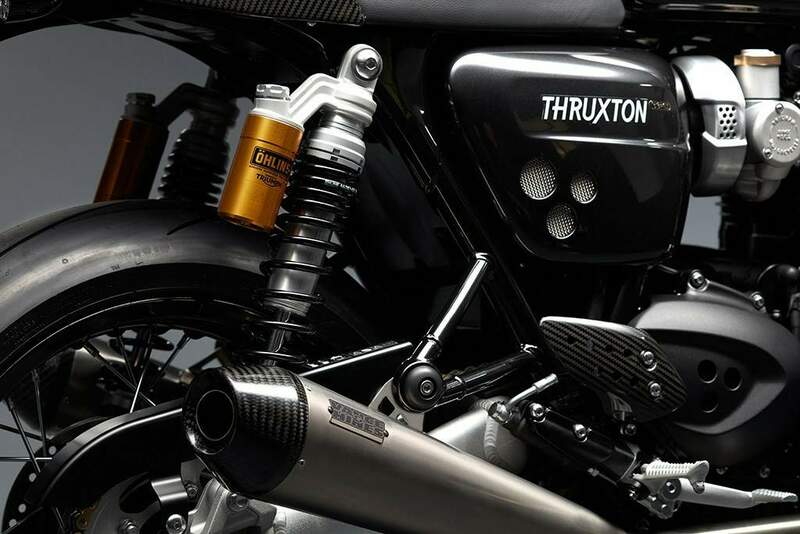 The Thruxton TFC also has a category leading higher level of specification and equipment with fully adjustable Öhlins upside down NIX30 front forks and fully adjustable Öhlins piggy back reservoir rear shocks with billet machined aluminum adjusters. There are also high-specification Brembo 4-piston M4.34 radial monobloc calipers and twin floating Brembo front discs delivering excellent stopping power. The Thruxton TFC is clad with race-spec Metzeler Racetec RR super sticky tires. The premium components continue with a Brembo radial master cylinder and MCS span and ratio-adjustable brake lever plus matching clutch lever. Increasing the level of rider-focused technology are three upgraded riding modes unique to the Thruxton TFC (Rain, Road and Sport), which now adjust throttle map, ABS and traction control settings to better suit the riding conditions or rider preference. This is enabled via the latest generation ride-by-wire, which delivers enhanced rideability, safety and control. 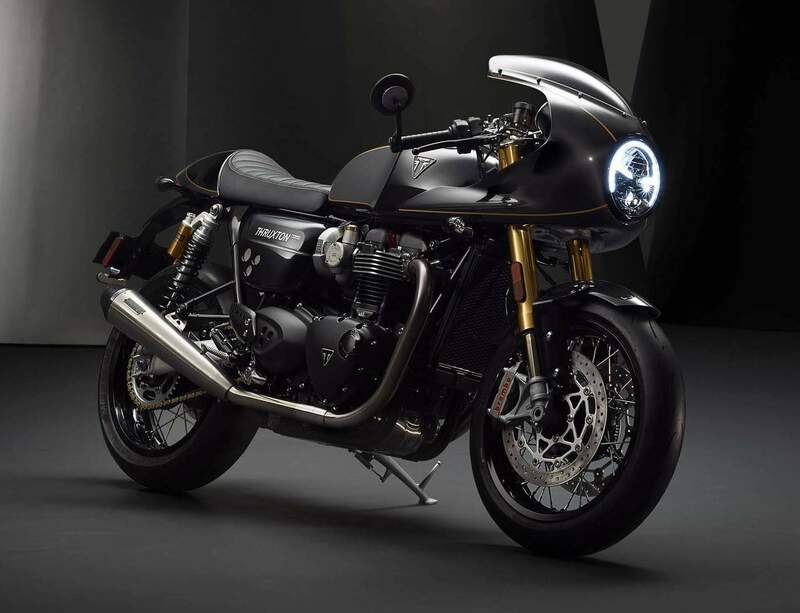 For enhanced visibility, lower energy consumption and greater durability, the Thruxton TFC features all-LED lighting, including a seven-inch headlight with signature profile daytime running light (market specific availability), compact LED indicators, tail light and rear light. ABS and traction control are also fitted for maximum safety and control, both implemented with minimal visual impact – compact, responsive and unobtrusive. Optimized to reduce lever effort for the rider, the torque-assist clutch makes the bike even more comfortable over long journeys and in stop-start riding, while the USB charging socket improves convenience. 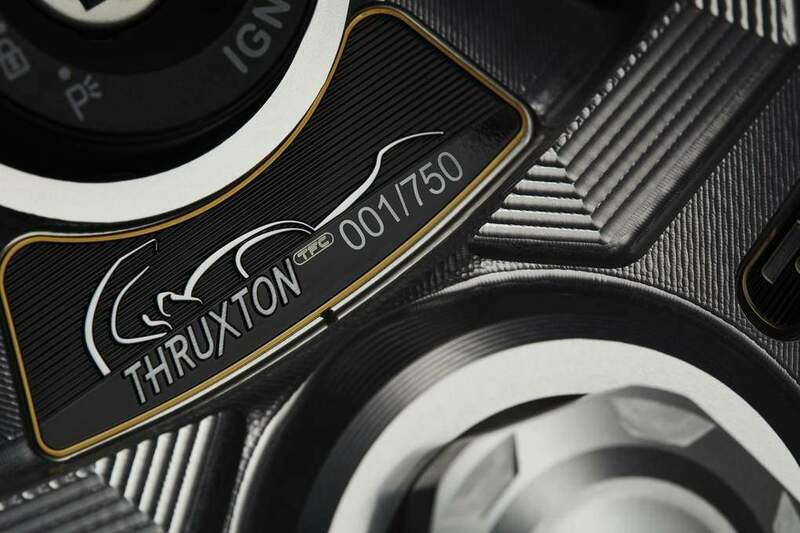 An engine immobilizer is also fitted as standard on the Thruxton TFC, with a transponder incorporated into the new high-value gold badged key.